Matrox’s Emmy award-winning technology powers a full range of content creation and delivery platforms used by broadcasters, post-production facilities, project studios, corporate communicators, videographers, and A/V professionals worldwide. Dan Maloney, Technical Marketing Manager at Matrox Video, explains how the new Matrox Monarch LCS Radar web application allows IT administrators to easily monitor the status, health, and activity of all encoders from a single dashboard. Overseeing the critical functions of every single encoder simplifies the maintenance and upkeep of the Monarch LCS devices, ensuring smooth day-to-day operations, whether for installations of one or more departments or deployments spread across multiple campuses. 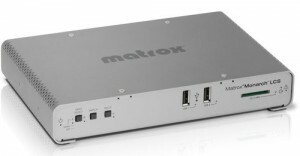 Matrox Monarch LCS lets you easily define profiles for live streamed and recorded lectures by mixing camera and presentation material from SDI and HDMI sources. Once configured, this versatile H.264 encoding appliance can be operated by anyone at the push of a button. And it won’t break your budget! 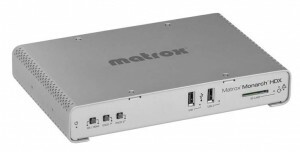 Matrox Monarch HDX is a simple and versatile video encoding appliance specifically designed for broadcasters and webcasters who need a flexible solution that is powerful enough to take on today’s video delivering workflows. Monarch HDX provides two encoders in a single device and thus can tackle any job; from streaming to two different locations, to recording a proxy quality file while simultaneously recording master quality version for post-event editing, to using one encoder for streaming while the other records at higher quality for VOD downloads. Whether used as a live streaming encoder or videorecorder, the Monarch HDX can integrate seamlessly into virtually any SD and HD installation. True 4Kp60! SD to 4K! 4K editing for professionals! Matrox Mojito 4K offers post-production professionals a fluid editing experience with uninterrupted playback, which lets them see every pixel of every 4K frame in real time for crafting breathtaking content. Matrox Mojito 4K lets you finish your productions while monitoring up to 4Kp60 for Adobe Creative Cloud software. Matrox Convert DVI Plus lets you output just the content in a region-of-interest at the broadcast resolution you need. Simply using your mouse, you can define any region of any size from your computer display. If the content you select doesn’t match the output resolution, Matrox Convert DVI Plus provides horizontal and vertical upscaling and downscaling. The snap-to-window feature automatically generates and positions a region-of-interest over a particular image or window such as a YouTube video within a web page. Create broadcast-quality video from Mac and PC computer applications such as Skype, YouTube, Google Earth, FaceTime, and web browsers. Use media players to play back videos stored on your computer.